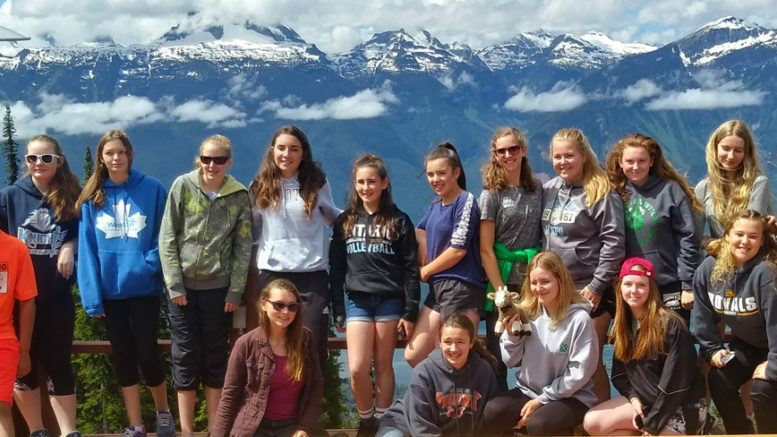 Earlier this summer, nine members of Lennox and Addington 4-H clubs travelled to Salmon Arm, B.C. as part of an exchange with the Deep Creek 4-H Association. They also hosted their peers here. Submitted photo. A group of Lennox and Addington 4-H members was reminiscing last week about a life-changing summer opportunity they experienced this July and August. Nine girls ranging in age from 12-18 — Grace Swinton, Sydney Schembri, Shannon Gibson, Kaitlin Kimmett, Marissa Kimmett, Saige Traise, Sarah Kay, Ryan Godden and Bronwyn Godden — went to Salmon Arm, B.C.for nine days in July, before returning the favour and hosting their new friends from the Deep Creek 4-H dairy club for a similar time period in August. Leader and chaperone Nan Keyes said the exchange is part of a program offered by 4-H Canada and sponsored by Heritage Canada. Part of the purpose of the program was to teach young Canadians about their own history and natural heritage. There was a realization among the exchange members that Salmon Arm isn’t as old as this part of Ontario, so there wasn’t the same idea of historic buildings. A salmon hatchery and hot springs were also destinations. Of course, the girls were also able to have a bit of fun in the tourist area, visiting beaches on Shuswap lake and riding the Pipe Mountain Coaster down the side of Mt. Revelstoke. While some of the 4-H members were billeted at sheep farms or dairy farms, they learned the geography of the area meant different types of agriculture took priority there, too. The mountains didn’t seem too hard to adapt to. Keyes noted one difference the group observed was that storms approach very quickly and, often, with the mountains it’s hard to see them coming in. Rain spoiled an outing or two. Back in Ontario, the learning continued. Leader Bridget Poole explained the local members, some of whom didn’t know each other when they signed up for the exchange, were heavily involved in planning. “Every activity we did, we had the girls vote on it. Everything was suggested, moved and carried by our girls,” she said. Keyes added that each took on a specific task and had the experience of having to phone people they hadn’t talked to before, looking for discounts and deals — all hands-on learning. Poole said each day, the group let their guests know who was responsible for planning. The girls seemed to like being part of the process as they scheduled day trips to places like Bon Echo Provincial Park, Fort Henry, downtown Kingston, and Ottawa. There was also a service project, farmer’s Olympics, and an association barbecue on Amherst Island. “It was very stressful sometimes, but it turned out it was really well planned at the end of the day,” Kaitlin Kimmett said. “I feel like we learned how to talk to people and get information,” added Gibson. Marissa Kimmett said one of the toughest things was getting the timing right on the agenda in order to get to places the group needed to go. The bus trip to Ottawa was particularly challenging with restaurants, hotels, and attractions involved. They also had to plan around a meeting and tour on Parliament Hill with Bay of Quinte MPP Neil Ellis. The visiting girls from British Columbia were intrigued by the historical sites available within a short distance from Napanee. They were, however, startled by the flat landscape and the amount of driving to get to places. Many of the participants added they made lifelong friends on the journey and most are still communicating via text messages or social media. Kaitlin Kimmett said it was also interesting to learn about the differences in the way 4-H operates in both provinces as well as the opportunities provided. Poole said the girls had a new appreciation for how often they get to participate at the Royal Agricultural Fair in Toronto, since many people from the west coast don’t get to show there. The exchange marks the second time Lennox and Addington 4-H members have participated in a cross-border event. Gibson said the girls did have some input on where they wanted to go, but ultimately, 4-H Canada matched the two groups based on their intended participants. Kaitlin Kimmett said she’d like to go on another exchange, but likely not back to the same area. Poole said that while the opportunity is offered every year, it may be some time before Lennox and Addington 4-H members participate in a similar opportunity. “To support 28 people to do tours for nine days, most associations could not do it every year,” she said, adding there was an intensive application process, including home studies for participants and police checks for volunteers. The girls also had to do considerable fundraising as they had a GoFundMe page, they sold pepperettes, and solicited a lengthy list of sponsors whose support they’re grateful for.